This is a time of year to try to slow down a little and enjoy our summer weather with family and friends. I hope that each of you will be able to do so, at least to some extent. There is much to report on happenings in ACP both nationally and in our chapter since I last wrote to you in April. 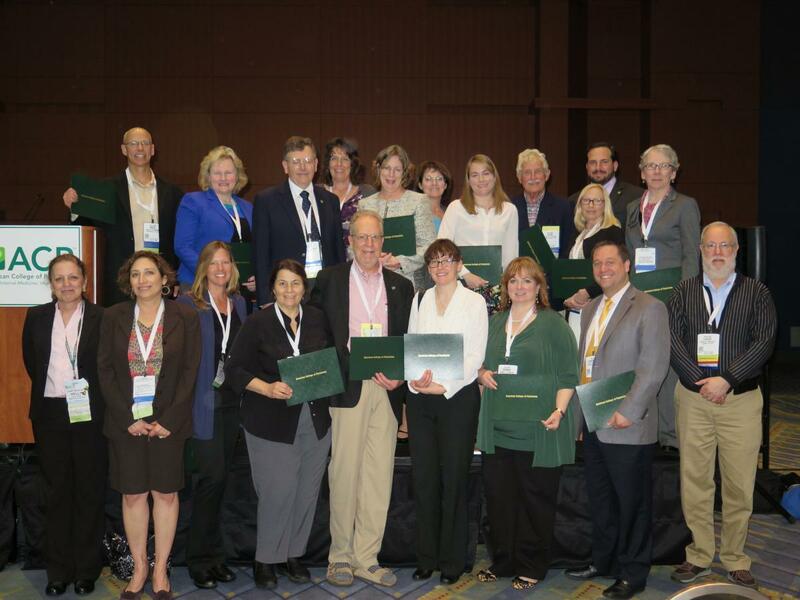 The first week in May was a busy time for ACP and our chapter, with the Spring Board of Governors meeting, Internal Medicine 2016, and Leadership Day 2016 all occurring during that week in Washington, D.C. Advocating Against “Cold Call” Pharmaceutical and DME Retailing—for the welfare and safety of patients who are being targeted, to maintain the integrity of the doctor-patient relationship, and to reduce unnecessary costs. Advocating for Inclusion of “Stop” Orders in Certified Medical Records—to all organizations whose scope includes improving patient safety with respect to pharmaceuticals that all EHRs should include the capability to electronically send “stop” orders to pharmacies and such capability should be required for EHR certification. Also, ACP shall request other professional physician and pharmacy organizations to support this EHR capability. Increasing Transparency and completeness of Clinical Trial Results when Presented to the Media—including also that institutions supporting studies make available online or in print at the time of initial press release sufficient details of their studies that clinicians can offer their patients educated and appropriate advice about the material included in the press releases. Also included in this resolution was direction for ACP to prepare and potentially publish a position paper considering the ethics of this issue. Clarifiying the Meaning of High Value Care to Other Organizations—such as CMS, Consumer Reports, and to the general public that the cost of medical care/procedures is not the primary determinant of value, but rather the benefit to the patient of such care/procedures relative to the cost. At the annual Awards Luncheon, the Wisconsin Chapter was one of a small number of chapters (7) presented with the John Tooker Evergreen Award; the goals of this program are to recognize chapter achievements, clarify and incentivize desired activities at the chapter level, improve sharing of best practices between Chapters, and encourage effort and innovation at the local level. Wisconsin Chapter's award was presented for High Value Care Cases Module at Annual Scientific Meeting. This module was developed by Dr. Ann Maguire, MD, FACP of our chapter in collaboratively with our chapter and national ACP leadership and staff. She presented this module at our 2014 Chapter Meeting, and she will be presenting it again at the 2016 Chapter meeting in September (see below under Chapter Meeting). Participating in this MOC module is one of many reasons to attend the upcoming chapter meeting! The 2016 John Tooker Evergreen Award winners, including ACP-WI Governor, Dr. Mark Belknap, FACP. Leadership Day was held on May 3 – 4. Leadership Day was held in Washington, D.C. on May 20-21. We had an active and diverse contingent representing the Wisconsin Chapter. 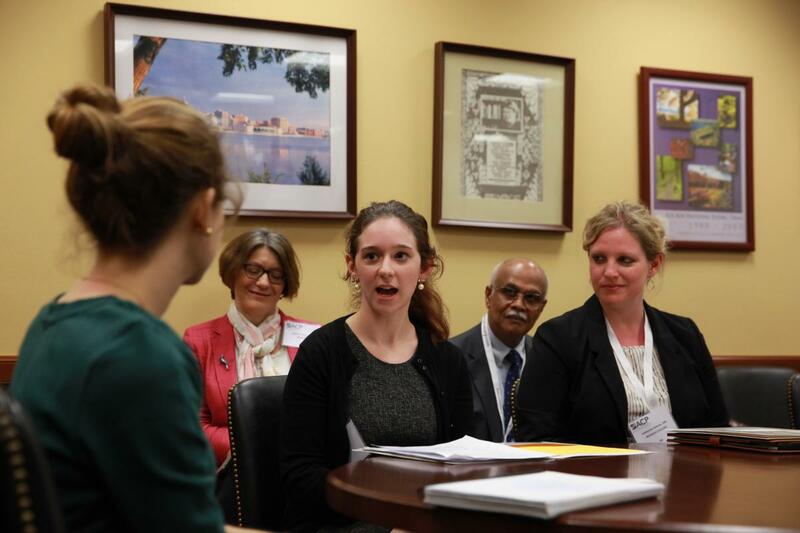 Click here for an excellent summary of the event and of the policy issues that we discussed and for which we advocated with our congressmen and their staff. It was prepared by one of the resident members of our contingent, Dr. Richard Martin of the UW Internal Medicine residency program. As I mentioned previously, the meeting was held in Washington, D.C. this year. The usual broad scope of high quality educational offerings was offered. Four recently elected fellows marched in the Convocation: Drs. Ravinder Vir, Paula Graf, Mirela Sandru, and John Murphy. 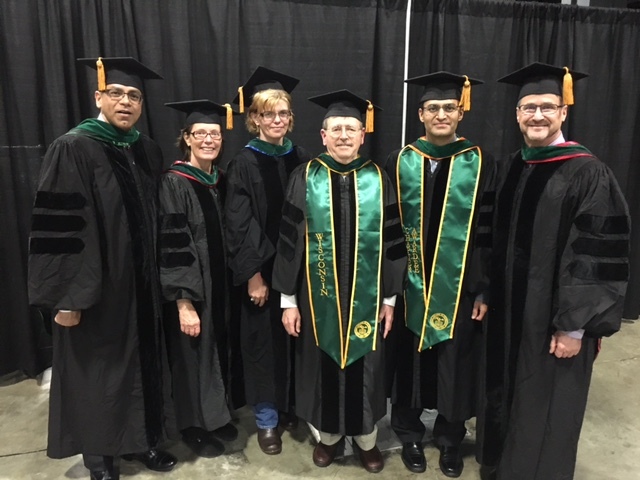 Dr. Rupesh Prasad also participated as a Wisconsin Chapter awardee. 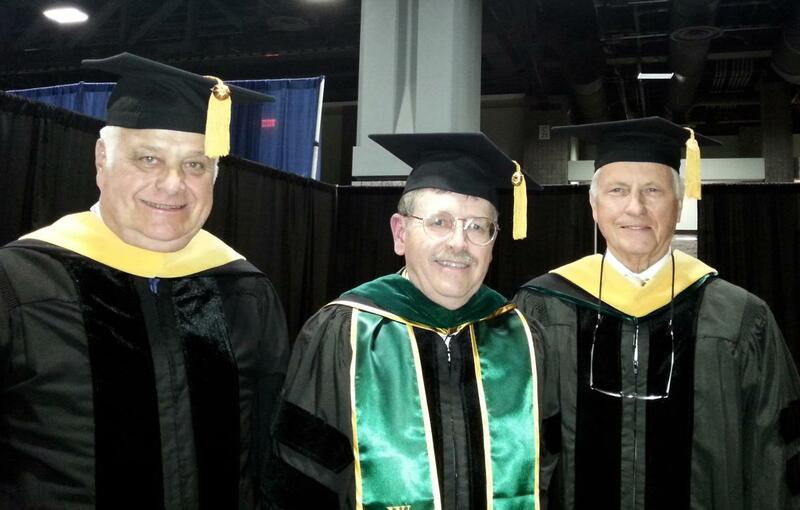 Additionally, two new Masters from the Wisconsin Chapter were among those honored and seated on the stage, Drs. Kim Hetsko of Madison and Richard Dart of Marshfield. Our chapter held a congenial reception, which was very well attended by members from Wisconsin; it was a good chance to meet and interact with our colleagues from throughout the state. Darilyn V. Moyer, MD, FACP, has been appointed by the Board of Regents as the next Executive Vice President and Chief Executive Officer of ACP, beginning Sept. 6, 2016. The selection was made after a national search and was based on the recommendation from a search committee appointed by ACP's Board of Regents. Currently, Dr. Moyer is professor of medicine, executive vice chair for education in the department of medicine; internal medicine residency program director; and assistant dean for graduate medical education at Lewis Katz School of Medicine at Temple University in Philadelphia. Her practice areas include primary care, HIV, and infectious diseases. She received the Temple University School of Medicine Women in Medicine Mentoring Award in 2012. An experienced, effective leader and medical educator, Dr. Moyer will continue to carry out ACP's mission in her new role as ACP's EVP/CEO. Steven E. Weinberger, MD, MACP, will remain at the College for a year as Associate Executive Vice President to work with Dr. Moyer and assure a smooth transition of leadership. Dr. Moyer has served ACP in many roles, including as Chair of the Board of Governors, Governor for the Southeastern Pennsylvania Chapter, Chair of the Health and Public Policy Committee, and Regent. Dr. Moyer had been elected to serve as President-elect for 2016-2017. ACP held a special election for the position of President-elect and Jack Ende, MD, MACP was elected. I have worked with Dr. Moyer in ACP since my first day as Governor-elect, and I'm looking forward to her leadership of the College and to working with her. She is a very worthy successor to Dr. Weinberger. Dr. Richard Baron, President of ABIM, announced on May 5th a new assessment option to the current 10-year high-stakes recertification exam. The new assessment option will take the form of shorter assessments that doctors can choose to take on their personal or office computer—with appropriate identity verification and security—more frequently than every 10 years but no more than annually. Please see the attached PDF for the announcement from ABIM. These ongoing changes come after continued ongoing conversations between ACP and ABIM leadership. I should clarify because of some apparent confusion in some ACP members' minds: ACP and ABIM are organizationally completely separate and independent, and they have no formal relationship. Their common attribute is that both organizations are dedicated to the high quality practice of internal medicine, and some internists involved in the administration of ABIM are ACP members. Please set aside time now to join your colleagues from around the state in attending the annual scientific meeting which will again be held at the Wilderness Resort in Wisconsin Dells. This year the dates are September 9 - 10, which are a Friday and Saturday. Dr. Nitin Damle, current President of ACP, and Dr. Doug DeLong, current Chair of the Board of Governors, are scheduled to be our visiting representatives from national ACP. As is our usual pattern, the Friday program is primarily devoted to MOC modules, of which we plan to offer 3 this year, and resident case vignette and poster presentations. This year, we will be offering a volume discount of 3 modules for the price of two, with the bonus module being the Evergreen Award-winning module on High Value Care (see above under Board of Governors Meetings). Saturday is devoted to a series of presentations of various pertinent topics in various specialties of Internal Medicine. This year, the afternoon of the Saturday program will be devoted to two public health topics of current intense interest, those being the Health Effects of Gun Violence and the Health Effects of Global Climate Change. Dr. Jonathan Patz, Director of the Global Health Institute at the University of Wisconsin and a leading authority in the study of the health effects of climate change, is scheduled to speak with us, and Drs. Damle and DeLong will also speak in their areas of expertise, global climate change and gun violence respectively, from the ACP policy perspective. Please plan to join us at this meeting, which promises to be both very instructive and interesting. Please click here to view the brochure for the Chapter meeting. We are accepting abstracts from Big M Members, FACP members and MACP members. Please submit your abstracts and corresponding conflict of interest (COI) forms for each author using the forms below. The deadline for Big M Member, FACP member and MACP member abstracts is Friday, July 15th. The Wisconsin Division of Public Health has asked that I provide the membership of our chapter with this information regarding HIV pre-exposure prophylaxis. Their program is strongly supports the use of PrEP by people at substantial risk for acquiring HIV infection. They have recently developed guidelines to support medical providers in offering PrEP to their patients. Please follow this link to access the article on this subject and its associated links to treatment guidelines. The Division of General Internal Medicine at Mayo Clinic in Rochester, MN, is seeking General Internists to add to our candidate pool for our growing practice. Qualified candidates should be board-certified/board-eligible in internal medicine with a desire for scholarly activity. Preference will be given to those candidates with additional year(s) of training in advanced General Internal Medicine (Chief Residency or fellowship) or internal medicine practice experience. Research training through fellowship or a Master's Degree program is desirable, but not a prerequisite for application. Mayo Clinic is an excellent choice for the candidate who is seeking a career in a world-class academic medical center that is consistently recognized by U.S. News and World Report as one of America's “Best Hospitals.” Mayo Clinic's multi-disciplinary group practice focuses on providing high quality, compassionate medical care with a primary value that “the needs of the patient come first.” Mayo Clinic is a nonprofit organization with approximately 3,800 physicians and scientists across all locations working in a unique environment that brings together the best in patient care, groundbreaking research and innovative medical education. Post offer/pre-employment drug screening is required. Mayo Clinic is an equal opportunity educator and employer (including veterans and persons with disabilities). ©2016 MFMER.